The story of two London spiral staircases. The renovation at Tate Britain changed the mood of the galleries with a grand spiral staircase in the rotunda. 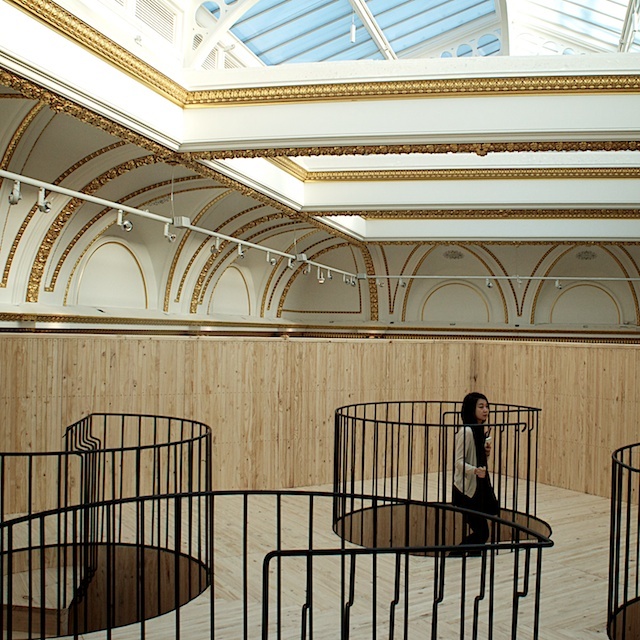 A very different staircase experience awaits visitors in the new exhibition at The Royal Academy. Hidden inside turrets supporting a massive timber structure the narrow stairways circulating in two directions lead to a deck built on top, where the ornate ceiling of the gallery can be examined close-up. At Tate the stairway designed by London architects Caruso St John is topped by a glass celling, linking the main floor to the lower level in style and opening up the circulation of the building. At Royal Academy the stairs are part of an experiment in architectural space and how we relate to it by architects Pezo von Ellrichshausen from Chile . One in spectacular in classical style and the other a play of vernacular, industrial and ancient forms, but both stairways are great examples of the beauty of circular stairs. At the Royal academy Pezo von Ellrichshausen’s structure is part of the exhibition Sensing Spaces (until April 6, 2014) on which more in our next issue.